Location: South side of Fishergate Hill. A housing development, Colman Court, now occupies the site. Located on the north side of the River Ribble, Preston West Lancashire Railway (WLR) station was the northern terminus of the WLR company’s Southport & Preston Railway which opened in stages between 19 February 1878 and 6 September 1882.
first sod was cut on 18 April 1873 at a special ceremony held at Little London, in Southport, attended by the Mayor, Alderman Squire JP. From the start the WLR project struggled financially and, although construction started successfully, it stopped abruptly when the contractor faced financial difficulties. A further WLR Act of 1875 authorised the raising of a further £187,500 and granted an extension of time for the line’s completion. A new contractor, Barnes & Squire, was appointed, and work resumed. A section of the line opened between Hesketh Park (near Southport) and Hesketh Bank on 19 February 1878, with a further southern extension to Southport Windsor Road opening a few months later on 10 June 1878. There then followed an extension to Longton on 18 May 1882 and finally to Preston on 4 September 1882, although it was actually complete by 1 September 1882 when a train was run to test the bridge that carried the line over the River Ribble. Official sanction was given by the Board of Trade Inspector Major-General Hutchinson for passenger services to run from 4 September 1882. The last two extensions were built by yet another contractor, Braddock & Matthews. 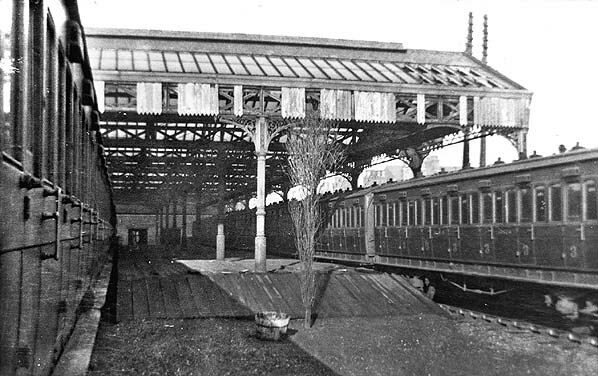 The first passenger train to use Preston WLR station ran on 5 September 1882. It was a special service as part of the grand opening ceremony and had come from Southport. The station was not actually complete at this time; building work was still in progress and would be for a number of weeks. This did not stop the WLR from running special services in connection with the Preston Guild week. Full public services began on 16 September 1882. Trams of the Preston Corporation terminated opposite the station entrance and provided a link with the town centre. The station was designed by the London railway architect, Charles Driver. It was built on made-up ground with its frontage on Fishergate Hill, the sandstone main building in Gothic style. Its spacious booking hall measured 40ft by 34ft. 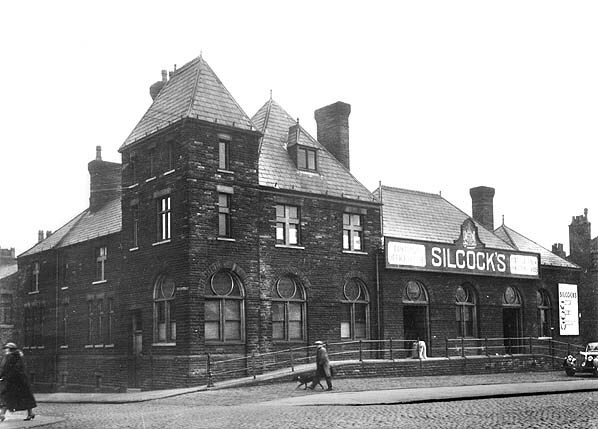 To its west was a general waiting room, a porters’ lamp room, a coal store and gentlemen’s toilets. This side of the station was single-storey. To the east of the booking hall was a ladies’ waiting room with toilets, the stationmaster’s office, a telegraph office and a cloak and parcels office; there were two more floors here including a three-bedroom apartment upstairs for the stationmaster. The single island platform was 400ft long and covered by a 200ft glazed roof of 70ft span. The roof was open-sided, supported on three rows of eight cast iron columns. a short distance south of the station, west of the line. The goods yard opened on 15 February 1883. It was west of the passenger station, at a lower level; a line led down to it passing behind the signal box. The yard had five sidings, a coal yard, a large goods shed, a cattle pen and, close to the yard’s entrance that led onto Fishergate Hill, was a weighing machine. 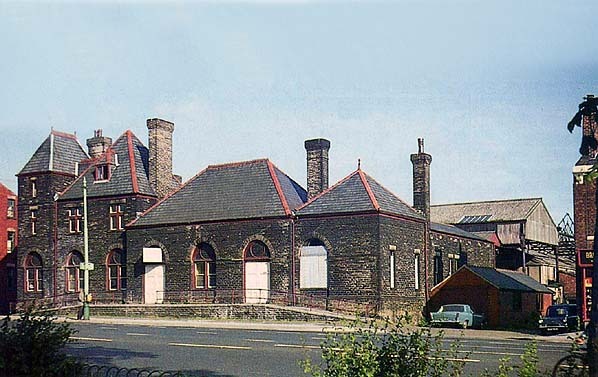 An engine shed with turntable was south of the station, east of the line, opposite the signal box.When opened to full public services on 16 September 1882 the station had services only to Southport Central. The following year, on 16 April, the WLR opened a line from Penwortham, south of the Ribble, to a junction with the Lancashire & Yorkshire Railway (LYR) at Whitehouse. A spur also ran from a junction just south of the Ribble Bridge, at what became Ribble Junction, to Middleforth Junction on the new line. This effectively created a triangle south of Preston WLR station which allowed direct running between Southport and Blackburn, but also directly to Blackburn. The Blackburn service began on 16 April 1883. The WLR involved itself in a number of abortive schemes all of which worsened its financial situation. An outbreak of smallpox at Preston in 1888 did not help matters contributing to an estimated loss to the company of £1,500 owing to the cancellation of excursion services. From 1 May 1888 a service was introduced between Preston WLR station and Liverpool Central. Trains travelled via the WLR line to Meols Cop (Southport) then via the Liverpool, Southport & Preston Junction Railway (LSPJR) to the Cheshire Lines Railway at Altcar & Hillhouse; from there they headed to Liverpool by a circuitous route. The LSPJR was, in reality, a creation of the WLR, and it made losses from the start. In 1891 Refreshment facilities opened at Preston WLR. A WLR timetable of 1 October 1896 showed eighteen departures from Preston WLR on weekdays; eleven ran to Southport Central, two to Blackburn, three to Liverpool Central, one to Longton Bridge and one to Barton (later renamed Downholland). The first departure was at 6:15 am and ran to Liverpool Central. The last was at 9:30 pm for Southport Central. The Blackburn trains originated from Southport Central and ran into Preston WLR station, then within ten minutes they departed for Blackburn giving the engine sufficient time to run around its train. By this time the WLR was effectively insolvent despite being reconstituted as recently as 17 August 1894. On 1 October 1896 agreement was reached for the company to be amalgamated into the LYR, which took effect on 1 July 1897.
was needed at Whitehouse, for which an Act was obtained on 1 July 1898. The contract for was awarded on 26 October 1898 to J Strachan for £9,713. On 16 July 1900 the new line opened from Whitehouse West Junction to Whitehouse North Junction. The new Whitehouse Triangle had been created only 30 chains east of Penwortham Triangle. On the day that the new spur opened Preston WLR station, only 18 years old, closed to passengers, but goods services continued. Trains on the former WLR ran into the joint Preston station. Middleforth Junction signal box closed, suggesting that the north-to-east Penwortham Triangle spur fell out of use at this time. Goods services running into Preston WLR would have had to travel over the original line from Penwortham Junction. If they approached from the east a reversal would have been necessary. It is likely that the engine shed closed at the same time as the station. From 1 to 6 September 1902 Preston WLR station reopened for excursion passenger services for the Preston Guild Week. From 1904 the goods depot became known as Fishergate Hill. By 1905 the junction at Middleforth had been lifted although the track on the spur remained in situ to Ribble Junction. By 1912 the turntable that had served the station engine shed was removed. The signal box was standing but had been out of use since c1902. The lower portion housed a telephone linked to the nearest controlling signal box at Penwortham Junction. Very little appears to have altered over the next fifty years other than the island platform being demolished and the appearance of fabricated buildings under the trainshed. The passenger station and goods yard was used for stabling excursion train coaches run in connection with the Preston Guild week of September 1922. Interestingly the station was photographed at this time from the air and coaches can be seen standing inside the trainshed as well as in the goods sidings. In 1922 the LYR was absorbed by the LNWR, and in the grouping of 1923 Preston WLR station passed into LMS administration. From 1948 the station was within British Railways London Midland Region. On 22 September 1962 an RCTS railtour visited Preston WLR station: the first passenger train to call since September 1902 and the last ever to do so. run to Preston WLR was a daily trip from Lostock Hall Target 17, 9T17, which brought in supplies for R Silcock & Sons, a local firm of provender merchants who used the former passenger station building at the time. Just over four months later Preston WLR station (and the entire Fishergate goods yard) closed completely, and all of the recently installed alterations were redundant. As a goods facility the station had latterly been managed by a goods agent, the last being James Mason. 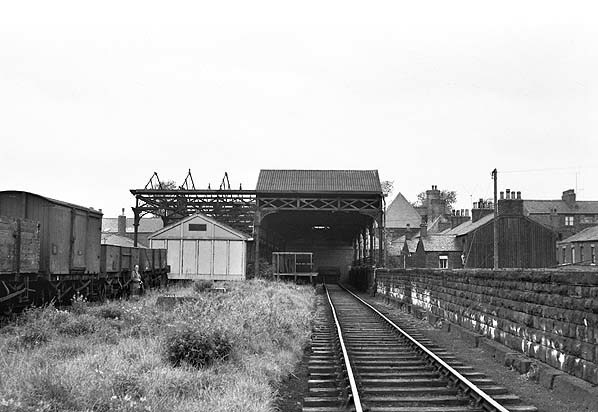 The track within the station area was lifted shortly after closure, and the bridge over the Ribble was demolished by 1968. The former passenger station building survived until 1976; the last user was Rednaw Cash and Carry. 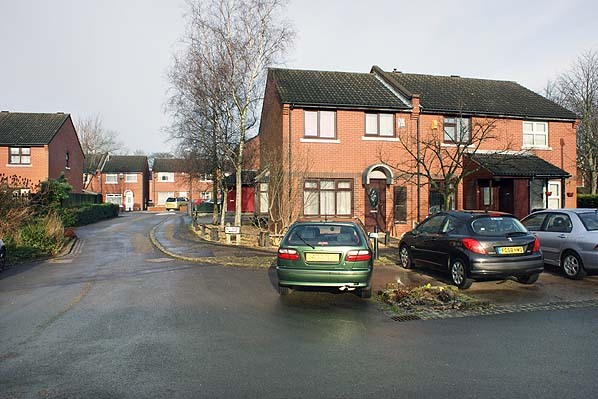 The site was later developed with housing (Colman Court). Ticket from Michael Stewart, route map drawn by Alan Young, Bradshaw from Chris Totty. Preston WLR station in September 1922. The platform had already been cut back from its original length. Despite the presence of the coaches, passenger services had not been reintroduced; they were from excursion trains to Preston for Guild Week. The former Preston WLR station was used for stabling the empty stock as space was at a premium. The trainshed was showing signs of decay only 22 years after regular passenger services ceased. 1893 1:2,500 OS map. 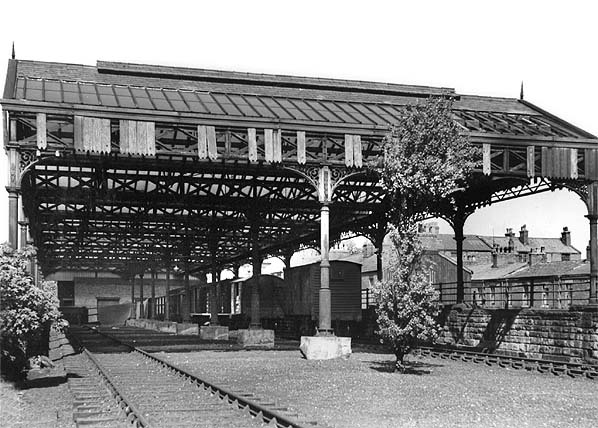 Preston West Lancashire Railway station when it was still the northern terminus of the Southport and Preston line. The map shows the passenger station with its long island platform that extended beyond the trainshed, the goods yard to the west and the engine shed with its turntable to the south. Outside the station, on Fishergate Hill, the terminus of a tramway running into the town centre can be seen. 1912 1:2,500 OS map. On this map the Preston West Lancashire station is shown as disused having closed to regular services twelve years earlier. 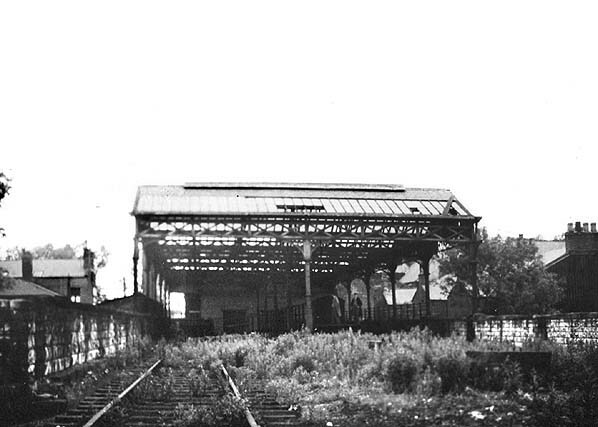 It was in use for goods services at this time, complementing the original goods yard next to it. The station's island platform was in situ, but the turntable, located to the south, had gone. The tramway which formerly terminated outside the station had been extended along the banks of the River Ribble. 1938 1:2,500 OS map. This map would suggest that all lines had been lifted at Preston West Lancashire Railway station; they had not, and would remain in use for goods services until January 1965. 1960 1:2,500 OS map. Preston West Lancashire Railway station five years before it closed. The former passenger station is described as ‘Warehouse’ on the map. It was used for that purpose by Silcock’s, and supplies were brought in by rail. The track layout had been little altered since the WLR period. 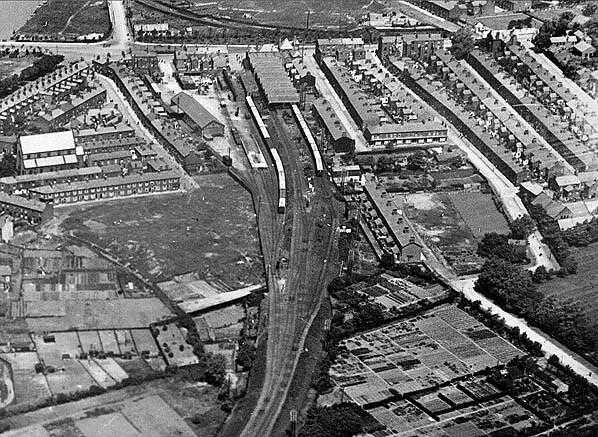 Aerial view of Preston WLR station and its approaches in September 1922. The trainshed roof can be identified and, to its left, is the goods yard. Although passenger coaches can be seen in the station it had been closed for 20 years. The coaches stabled at the station were from excursion trains run as part of Preston Guild Week. Preston WLR Station seen from Fishergate Hill in 1936. Although the goods station was still open, the passenger station buildings were redundant and leased to Sicock's, a provender merchant. Preston WLR station looking north towards the buffer stops in 1936. 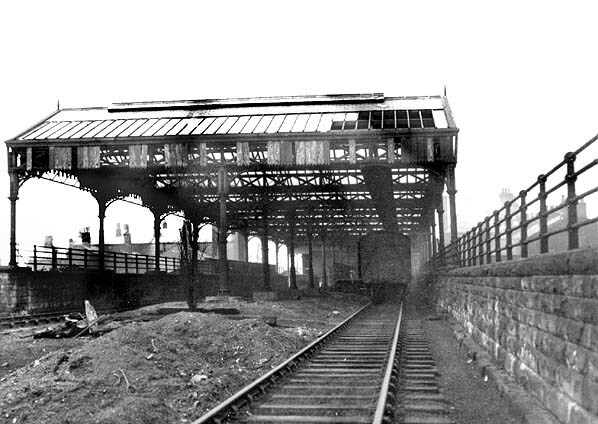 The trainshed was still in its original form at this time but the platform had been demolished. Looking into the trainshed at Preston WLR station in June 1946. A section of the trainshed roof had been removed by this time as had the island platform. Despite its overgrown appearance it was still in use as a goods depot. The last passenger service to Preston WLR visited on 22 September 1962. It was theRCTS (Lancashire Branch) 'Mid Lancs Railtour', seen in this view looking north towards the station. The train could not run all the way into the station as there were no run-round facilities, so it stopped on the approach lines short of the terminus. The locomotve hauled the legs from Preston West Lancs Goods to Penwortham Junction, then Penwortham Junction to Longridge (via Farrington Curve Junction), and finally Longridge to Preston EL where 42844, a Hughes ‘Crab’ took over. The stock consisted of 5 ex- LMS corridor coaches. Seen working 1X23 is G2, 0-8-0 49451. Built for the LNWR to a design by Beames in October 1922, this loco entered service as 231 and received the LMS No. 9451 at the grouping. 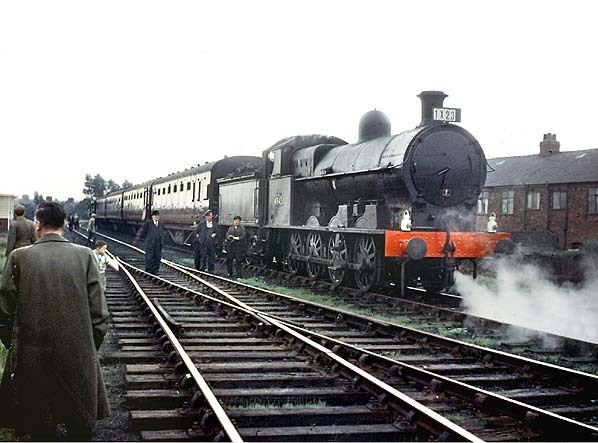 It was renumbered 49451 at Nationalisation, when allocated to 10B, Preston shed, before moving in December 1950 to 8C, Speke Junction and finally to Wigan Springs Branch in August 1959. It was withdrawn in November 1962 and cut up shortly after, with only one of the class being preserved. This class became commonly known as 'Super Ds' or 'Duck Eights' and was normally seen on freight duties. Looking north towards the buffer stops at Preston WLR Station in September 1962. The station was still in use as a goods depot at this time. Preston WLR station looking south from Fishergate Hill in 1968. The station’s frontage building can clearly be seen as can part of the trainshed roof behind it. The station survived very much in its original form despite closure to regular passenger services 68 years earlier, and to all traffic in 1965. Looking north in 1976 from what would have been a point inside the trainshed at Preston WLR station, facing the booking hall. 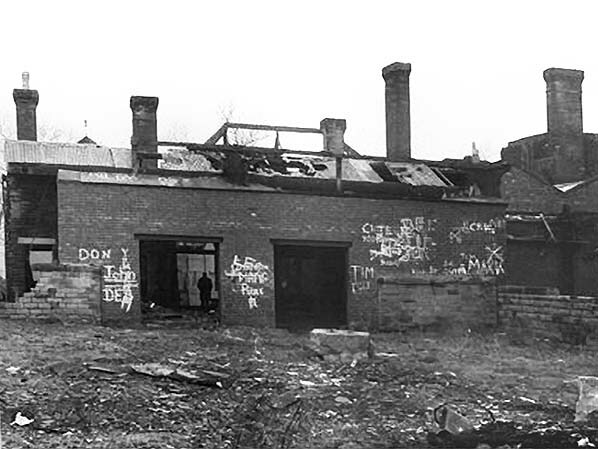 The station building was still standing but in a derelict state. 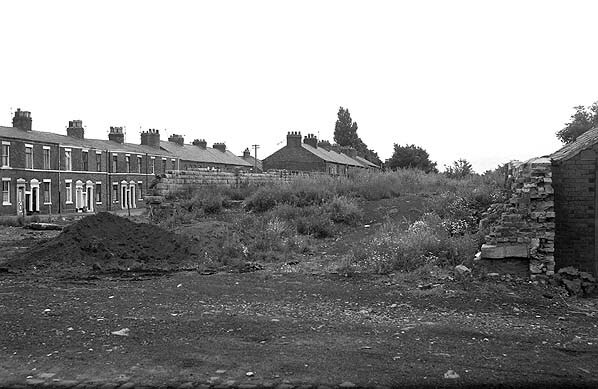 Preston WLR station looking south in August 1978 after the station’s building had been demolished. The island platform and trainshed had been located on the built-up ground directly in front of the photographer. Looking north at the site of Preston WLR station towards the site of the buffer stops in January 2012 from a point just south of the former platform’s end.